It doesn’t matter that you have excellent customer service alone, it matters how complete your offering is and how you dedicate yourself to it. The cost of acquiring customers is high; it includes marketing budget, sales time and delivering a product. The longer you keep a customer, the more return on your investment of sales time and marketing resources. It’s somewhere between 5 and 25 times more expensive to acquire a new customer instead of retaining one. This is why the largest companies in the world try to make you brand loyal and maintain your attention. You should be focusing on keeping your customers over acquiring lots of new ones. The math works out as a far better way to grow your company. So how do you keep customers? Customer service. Your customer service is part of your sales process (even if it requires a different skillset). Think of it like you are “reselling” your customers on your product or services every time they need customer service. You are selling them on the idea of continuing to use your product. You are giving customers confidence in their choice of your company, that they got the best deal for them (not always the least costly) and that there is no reason to look elsewhere because they are happy where they are. Whether you sell to consumers or businesses, this idea remains true. They view your support as part of the product. 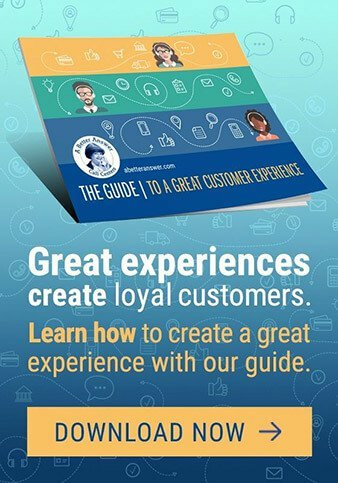 By creating a great customer service moment for your customers, they will keep coming back. They can even walk away from these experiences more satisfied than they were before. The better your customer service, the higher your retention will be. In fact, 52% of customers report poor service as their reason for leaving a provider. It’s essential to invest the time, resources and culture so your service is a full customer experience. Everyone thinks of customer service a little bit differently. It’s easy to become too focused on one part of customer service when it’s often multi-faceted. Customer service can be as simple as an easy and responsive scheduling system, digitally or by phone, or it can be a full team of expert troubleshooters. Make your website easy to navigate, and your contact information easy to find. Ensure your phones always have a trained representative answering them. Be available when your customers need you. Interact quickly on digital platforms if you have them, such as Facebook. Ability to problem solve, even if you don’t have the solution yourself, know who does. Make sure that whatever platforms you do use, they are always manned. It doesn’t help you if your Facebook page never has anyone responding to comments. If no-one is monitoring your catch-all customer emails, then they’ll become frustrated and feel ignored. The best piece of advice for creating a customer service experience is to engage and manage whatever platforms you do choose to use. There are always new ways to engage with customers to help increase retention. No matter what releases, apply the above advice. If you can’t integrate it into your business or dedicate your staff to it, don’t use it. Chatbots have become a popular addition to company websites and are a fantastic way for customers to get basic questions answered, but if you don’t have a service team to back it up for the more complicated conversations they can taint the whole customer experience before you ever get a chance to talk to them. Supporting a chatbot with both an answering service and chat representatives allows your customers to have a complete service experience for their complex needs, no matter how they choose to escalate the conversation. Your sales process never really stops. Customer service is an extension of your sales team. They keep your customers happy and willing to spend more money with your business. The key is to create a complete experience and dedicate yourself to your chosen platforms or work with a partner who can do that for you. If you have strong customer service, then you’ll retain more customers and grow a more profitable company.